Hey guys, ive had ML for awhile now on my Canon EOS Rebel T5, but i still do everything pretty analog. I mainly used it for product photography (the ghost image was super helpful) but with the solar eclipse happening monday i was hoping to use it a bit more. 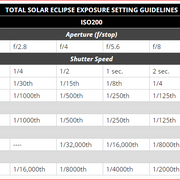 B&H photo has this: https://www.bhphotovideo.com/explora/photography/tips-and-solutions/how-photograph-solar-eclipse Guide to shooting the eclipse at specific settings for different moments during the eclipse. I would like to generate a script to bracket at all of the exposure settings, so if i were to run an intervalometer or if i manually trigger the shutter a series of photos will be captured, one at each setting listed, then i press it again to take the entire set again. I plan to have another camera set with a solar filter, to be shooting before and after totality, but my t5 i want to use during totality in an automated fashion so i can enjoy and take in those brief 2 minutes. Any help would be awesome and i know its super short notice. Their may be other users here who could use something like this too. Thanks everybody. Im going to be glued to my pc tonight to see what i can come up with so just ask if you need Anymore details. Attachment of settings to save some time. I had not, mainly because ive been struggling with narrowing down my search terms. Thank you so much Walter. This would have been way over my head for learning in one night. Im gonna get some real rest and prep for testing this tomorrow. Again thank you. If you have any guides or tips(im just lazy now) on how to implement and use this script, another link would be very much appreciated. Thanks in advance.